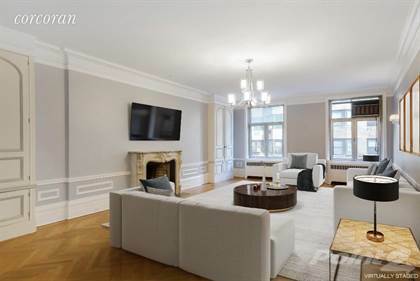 "Located directly across the street from the Metropolitan Museum and Central Park, this elegant 7 room apartment is for sale for the first time in more than 50 years and presents the perfect opportunity to create your dream home. The light-filled apartment was designed for grand entertaining as is immediately evident from the generous proportions of the rooms and the abundance of pre-war details including the wood-burning fireplace, exquisite moldings and stunning herringbone hardwood floors. From the moment you enter the large foyer from the semi-private landing there is a feeling of elegance and sophistication. The living and dining rooms are over-sized and there are 2 bedrooms, including a corner master, and 2 bathrooms. The large, eat-in kitchen includes a washer/dryer and is adjacent to 2 staff rooms as well as a staff bathroom. There are ample closets throughout the apartment and it also has access to a basement storage unit. Built in 1926, 1016 Fifth is a beautiful limestone and beige brick building with a stunning grey marble lobby that is one of the most unique on Fifth Avenue. The building offers white glove services including full-time doormen, a live-in resident manager, and a gym. All this in a prime location on Fifth Avenues Museum Mile and in close proximity to some of Manhattans best shopping, restaurants and schools. Pets and pied-a-terres are welcome. " Hi, I'd like to find out more information about 1016 Fifth Avenue. Thanks so much!